Put all of the paste ingredients into a blender and blitz until smooth. Heat a wok then add one third of the paste to the paste to the pan. Stir-fry for one minute or until the rooms fills with a gorgeous aroma, then add in the chicken. Coat the chicken in the paste, then add in both lots of the aubergines. Pour over the coconut milk, fish sauce, sugar, lime leaves and chilli and let simmer for about 7 minutes or until the chicken and aubergines are cooked through and the sauce has thickened a little. Pour into a serving pot and sprinkle with Thai basil leaves to serve. 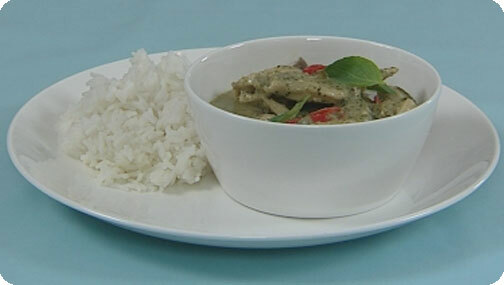 Serve with Thai fragrant rice.